Our cut to size service for MDF, Plywood, Chipboard and all wood based sheet materials provides some very unique advantages. Compare our ‘cut to size’ service with other suppliers. Avon Plywood’s Cut to Size Service. 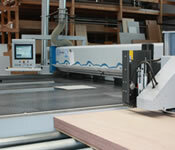 We cut to size MDF, Plywood, Chipboard, Veneered MDF, Melamine Faced MDF and other wood based sheet materials. Magicut optimising software to convert cutting lists into the most effective and economical cutting plan. Precision cutting using two Holzma beam saws - the accuracy achieved is outstanding with tolerances within 0.2mm or better. By planning efficiently we can save time, excessive waste and reduce costs. Send us your cutting list for an accurate cut to size ‘best value’ quote. Quality materials at great value prices. Discounts are applied to larger orders. A complete ‘cut to size’ service from stock to despatch. Precision Cutting : Avon Plywood has, over many years, established a reputation for precision cutting. Our ‘cut to size’ service uses leading edge equipment and software resulting in fine tolerances and a very high quality finish. More than just ‘cut to size’ : We are one of the UK’s largest stockists of MDF, Plywood, Chipboard, Blockboard, Hardboard, OSB and other wood based sheet materials. That means our customers receive a ‘one stop’ cut to size service : quality materials, specialist advice, great value and faster turnaround. Fast “Cut to Size” Quotations : To obtain a quotation simply send us your Cutting List – we will input it into our computer-based optimising programe and calculate the most effective and economical way to process your order.